Live Life Like a Best Seller: Graffiti Be Gone? 1) This is our story - not a local politicians campaign blog. 2) We know that the Balkan history is sorted and painful resulting in a lot of political unrest. 3) Everyone has their own opinion(s) when it comes to politics. 4) We really are not interested in offending anyone or even starting a discussion on the matter. 5) Ohhh yeah, and we can't understand Serbian well enough to follow what's going on in politics. All of that, and now I am going to briefly talk about something that may be considered "political." Last week, former New York Mayor Rudy Giuliani was in Belgrade, Serbia, and once he left, the image of Subotica started improving just a bit. Coincidence? Perhaps. But maybe, just maybe, one former politician had the words and suggestions to bring about positive change for another country. Serbians may not believe that he has any right to speak to them about improvement for their country, but he does have a proven track record in America. That's just my opinion. 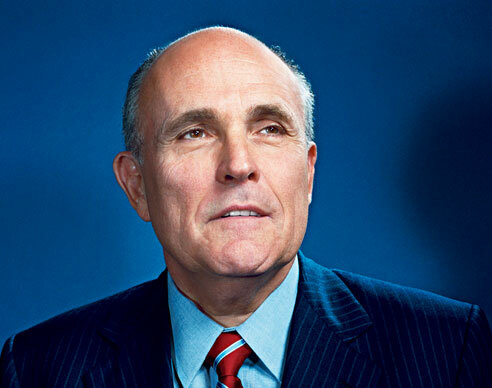 As most know, Giuliani stands out as one of America's most memorable (former) Mayor's for his response and dedication to console and cleanup after the September 911 attacks. He also cleaned up the image of New York prior to those attacks by attempting to eradicate graffiti in the sprawling metropolis. He saw graffiti as a symptom of urban decay and he put actions behind his words. Now days, Giuliani has his own consulting company (along with several other personal businesses) and while he says he visited Belgrade on "personal business" and was not paid by any political party, some in Serbia have their own suspicions and ideas. It is campaign season in Serbia. 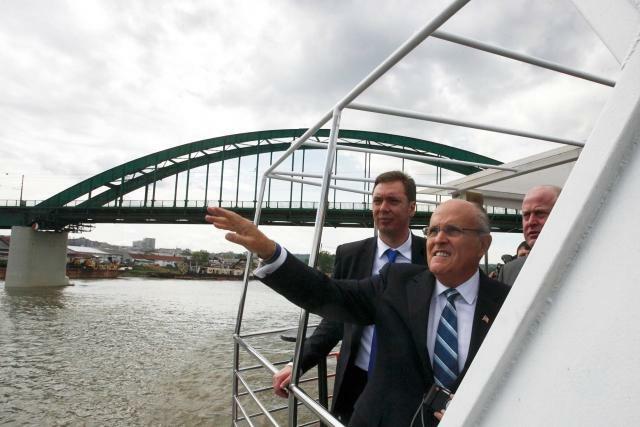 Former Mayor Rudy Giuliani in Belgrade, Serbia. These are the posts in the center of Subotica, Serbia - covered in layers of Graffiti. When we first moved to Subotica, I was shocked by the graffiti that covers almost every building. Walls and windows are vandalized with gang tags, political bashing, hateful phrases, and a whole lot of words that I (luckily) cannot understand. From the outside, even our apartment building looked like a ghetto, but once inside the cozy, remodeled flat, you forget how derelict the exterior appears. I secretly wanted to take a bucket of paint and a brush and freshen things up a bit. . .
. . . . But as soon as former Mayor Giuliani left Serbia, this guy (above) showed up and gave our building a fresh coat of paint. It's amazing how much better the center of the city looks now. I have no idea if Mayor Giuliani's presence in Serbia and his stories of New York improvement had any impact on Subotica painting over some of Her graffiti. Maybe there is no connection, but regardless, any improvement is good improvement. New paint for how long? Until grobari (gravediggers) gets busy spray painting UZAS and PFC and JFSU and other crap all over it. Or the nationalist brotherhood comprised of 15 year old goes and sprays the CCCC (cross with C's in every corner) on the walls. Yea, some people don't have any respect for their surroundings.. I really hope that the new paint job lasts for a while. It is true - a lot of people have no respect for anything that is not "theirs." There is so much potential in this town, and it is nice to see some improvements. I really hope it stays clean and that more of the city gets painted. Ha ha, "džaba ste krečili" will be written over that white wall in a matter of days! I really hope that the vandals stay away this time! It is just disrespectful of others. Cross your fingers. You see ,I think graffitis are part of the charm of Belgrade or any other Serbian town. Not the ones from Partizan or Zvezda's fans or the ones with four S, but the smart and artistic ones, the ones that say I Love you Milice or the above mentioned one : You painted for nothing. It kinda shows the personality and humor of its citizens. I know it is considered illegal but the buildings really belong to everybody ( at least the outside of it!) so why not??!! I have just visited Budapest and it looked really strange not to see any graffitis in the city , really sterile! I my self have never wrote any graffiti on the wall but I think they represent an artistic expression and would love to see them legalized. We would then really see the true artists come and show their best work and not just the ones done fast in the middle of the night ! Before you judge my comment please think of it with open minds! I have heard this point of view for graffiti several times - and I love art and wish that graffiti artists had specific places to showcase their work in Serbia. The concept of no one actually "owning" the exterior of a building is so strange to Americans, but I realize that is often the case in Serbia. When I see graffiti in public places (where it is illegal), I instantly tie that to thoughts of "oh this is a rough neighborhood and bad things happen at night." Just my perspective. :) Thanks for your thoughts!